(P1) It seems kindness is still reciprocated and it is true that virtue is its own reward. (P2) Kasey Simmons, a waiter at an Applebee’s restaurant in Dallas, Texas, found a $500 tip on a $0.37 bill on Aug. 16, according to CNN. The bill was accompanied by a message written on a napkin that told the heartwarming story behind the tip. (P3) The previous day, Simmons was shopping at a local grocery store. In the checkout line, he saw an older woman who looked depressed. He walked up to her and tried to lift up her mood while other shoppers passed right by her. She didn’t explain why she was sad while he paid for her groceries. “It was only $17, but it’s not about the money,” he said. “It’s about showing someone you care. (P5) The day Simmons met the woman was one of the toughest days of the year for her. It was the third anniversary of her husband’s death, and she had been struggling to overcome her anguish. (P6) “You insisted on paying. Told her she is a very beautiful woman. I have not seen this woman smile this much since dad died,” said the note. (P7) The daughter didn’t let him know her mother’s name, but instead, let the world know that a simple kind gesture can have a priceless impact. Do you think more people should show acts of kindness to strangers? Why or why not? Tell me about a time when someone was kind to you. How do you feel when someone is kind to you? What’s the name of the restaurant chain the server works for? 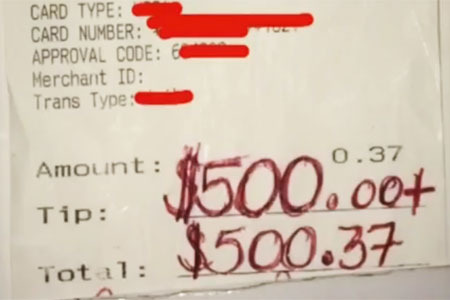 What was the total cost of the check to include the tip? How many years has it been since the death of the woman’s husband?